Until the early 60's Hans remained atop the German chart of popular first names. Since 1960 the popularity has declined, however, and this is the good news, HANS is back! Not only as a boy's name, but also with the adjunct “Lucky” as the name labeling our Gin. True to the traditional roots of the name, Lucky HANS is produced using herbs, fruits and berries, which all call Germany home. You will not find any exotic botanicals on the list of ingredients, (I.e., lemon, tonka bean, vanilla etc.). Instead we make use of local fruits such as apple and pears as well as a very special native berry: The rowan berry. Maybe you are thinking, “Wait a minute! That's poisonous!” but have no fear. This is untrue. The rowan berry should not be eaten raw as they contain parasorbic acid, which can cause an upset stomach, however, as distillate this berry is completely safe and a genuine indulgence. For this reason, Bavarians have used the rowan berry for centuries to create highly seductive spirits. This not only makes HANS happy, but also qualifies it as the perfect ingredient for our Bavarian Dry Gin. With a lot of local spirit Lucky HANS Bavarian Dry Gin is exclusively distilled with botanicals which are native to Germany. Aside from the classic ingredient “juniper” six other botanicals are processed. Distillation is made in small batches in the Bavarian Forest using traditional wood burning copper pots. The result is a Gin with a fruity core which is well suited to classic bitter tonic waters. Without this, there’s nothing! Juniper is responsible for the savory spice flavor of any Gin thus forming the predominant basis for any further botanical. Native fruits endow their presence resulting in Lucky HANS’ fruity core. These apples originate from luscious Bavarian orchards. The lavish sweetness of the pear harmoniously rounds the fruity tone of the apple. They too are cultivated locally in Bavaria. The berry your mother warned you about. But have no fear, the rowan berry is harmless when used as a distillate. It gives the Gin a creamy hint of marzipan. A tad sloe is a must. With its bitter note of fruity acidity, it provides Lucky HANS with that certain kick in the finish. The same applies to the green fruit of the walnut tree. The husk contains valuable bitter compounds, which lend to Lucky HANS’ extra “oomph!”. Naturally, a true Bavarian Gin must contain malt as an ingredient. This grain contributes to the flavorful spicy juniper basis. 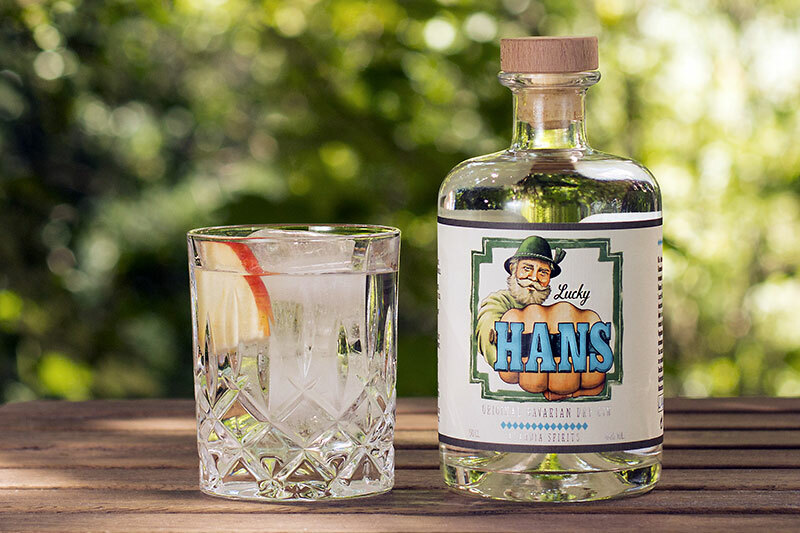 You want to know more about Lucky HANS Bavarian Dry Gin? Just send us a message and we will take care of your questions. You can also contact us if you want to import Lucky HANS Gin to your country or offer it as a reseller! Die Datenschutzbestimmungen habe ich zur Kenntnis genommen und akzeptiert. Mit dem Absenden des Kontaktformulars erkläre ich mich damit einverstanden, dass meine Daten zur Bearbeitung meines Anliegens verwendet werden. // I have read and agreed the Privacy Notice.